Beanpot Headlines Upcoming TSN Games - College Hockey, Inc.
45 games available to TSN subscribers in next six weeks. 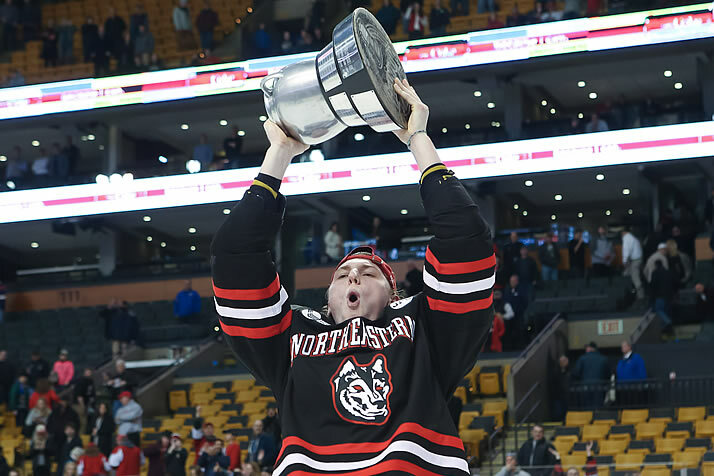 Last year Vancouver Canucks prospect Adam Gaudette and Northeastern took home the Beanpot. TSN’s coverage of NCAA hockey will feature 45 games in the next six weeks, highlighted by coverage of the men’s and women’s Beanpot tournaments, Boston’s historic celebration of college hockey. This marks the fifth year of TSN’s coverage of the men’s Beanpot, which features Boston’s four Division I programs competing at TD Garden on the first two Mondays of February. Between them Boston College, Boston University, Harvard and Northeastern have 35 NHL draft picks on this year’s rosters and have produced 52 alumni who have appeared in the NHL in 2018-19, including Jack Eichel and Johnny Gaudreau. The women’s Beanpot features the same four schools, which have produced alumnae like Kendall Coyne (Northeastern), Marie-Philip Poulin (Boston University), Angela Ruggiero (Harvard) and Alex Carpenter (Boston College). Northeastern (No. 3), Boston College (No. 7) and Boston University (No. 8) are all ranked among the top eight teams in the current national polls. The NCAA hockey on TSN postseason broadcast schedule will be released in early March.